Wool was the hot topic of industry conversation again this week but it wasn’t enough to distract the market from deciding on what fibres it wants to support. Results were particularly mixed with fine fibres attracting premiums whilst the rest of the categories felt losses. Overall, the market indicators held reasonably still considering there were very mixed results between categories. 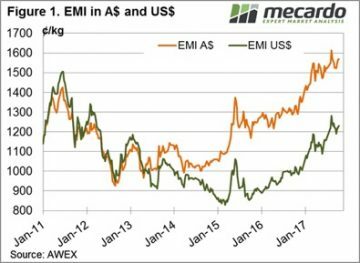 The Eastern Market Indicator (EMI) improved slightly on last week, gaining 2¢ to 1,568¢ in Aus$, while in US$ terms it rose 7¢ (figure 1). Western Australia fared worse off with the Western Market Indicator (WMI) falling 7¢ to 1,614¢. There was a distinct preference split between fibre categories across the country this week. The total market has been moving in sync for much of the last few months so this divergence could be a return to greater differentiation between the activity of wool types. Finer fibres of 19 microns and under all received price gains on last week, up to 45¢. Buyers were clearly chasing the finer microns as reflected in the solid trend of the finer the micron the increase in price gains to the week. On the other hand, medium to coarse wools of 19.5 to 23 MPG weren’t as readily sought after. Prices fell on average 20 to 30 ¢ by the weeks close. Crossbred wool followed the lead of the medium to coarse Merino fibres, losing ground across the board. The harshest fall was in 28 MPG at an average drop of 30¢ in both Fremantle and Sydney markets. Again, the finer fleece led by example to the skirtings and cardings market. Improvements were on average 20 to 35¢ for cardings indicators and generally ranged from 30 to 60 cents for skirtings. .
45,792 bales were traded this week, with a pass-in rate of 6%. We’re still seeing the offering at much higher levels compared to this time last year (up 11.8% for week 16 this year), reflecting the performance of this season. 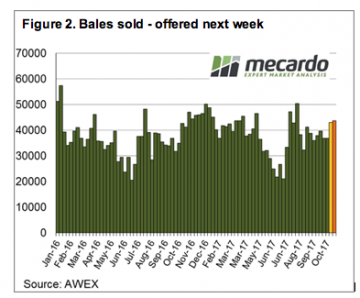 The number of bales on offer next week is expected to drop down to a listing of 43,764 for the three selling centres over Wednesday and Thursday (figure 2). The focus on micron this week might be an indication of where the market is starting to move to. Some strong forward prices in the 18.5 and 19 micron wools where buyers were willing to pay a premium out to next year suggest that preference for the finer wool is likely to grow.